The Auto-Bolt™ is simple. The dead-bolt approach for securing all types of doors has been around for hundreds of years and has changed very little. It is right up there with the wheel regarding inventions that have never lost their simplicity and effectiveness. The Auto-Bolt™ is literally and figuratively invisible. When The Auto-Bolt™ is activated, it is literally invisible from inside or outside of the vehicle. Because there is no separate remote device for The Auto-Bolt™, it is figuratively invisible to the thief, meaning he does not know that it exists when he attempts to steal the vehicle. If the thief can’t see it, the thief can’t defeat it. The Auto-Bolt™ is strong. The Auto-Bolt™ was designed so that any pressure placed on the door is transferred to the sheet metal, not the Auto-Bolt™ itself. 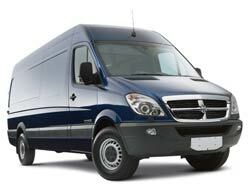 Assuming a thief discovered its existence, it would take in excess 1,800 lbs of pressure to break The Auto-Bolt™. For the thief to even gain access to the bolt, he would need heavier than usual equipment that would slow him down and add difficulty and risk. The Auto-Bolt™ is super convenient. Close the door, push a button. The Auto-Bolt™ is motor driven. There is no solenoid and therefore no power drain when activated. The Auto-Bolt™ is versatile. 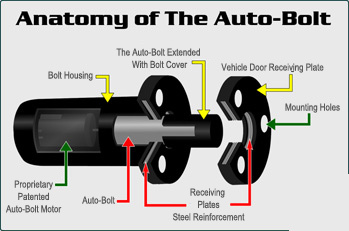 The Auto-Bolt™ can be installed on every door of every kind of vehicle. This includes front and rear doors for all cars and trucks, sliding doors on mini-vans, back doors on work vans and doors on construction equipment. The Auto-Bolt™ is industry friendly. Although the Auto-Bolt™ is a force to be reckoned with on its own merits and has proven effective as a stand-alone security device, it is industry friendly and effectively enhances rather than competes with other vehicle security systems or devices. There is no need to replace your existing security system, just add The Auto-Bolt™ as a powerful additional layer of protection.